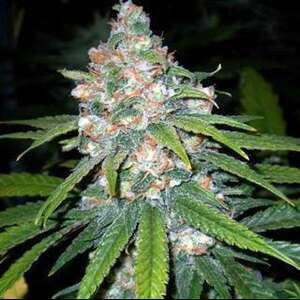 The times when a sativa is 5 meters high and has an extremely long flowering time are over. We crossed a Super Lemon Haze with a Ruderalis and created a Minisativa. Lemon Haze Auto retains the best qualities of its sister, winner of the HTTC Cup. This special Sativa strain provides a fast-acting and cerebral effect with slight physical relaxation. Even the most demanding smoker will not disappoint Lemon Haze Auto as it tastes wonderfully like lemon. It is very easy to grow, very resistant to low temperatures (it only requires temperatures above 10 ° C) and is therefore suitable for beginners. It thrives best with 18 hours lighting from start to harvest. It is ready after 7 weeks of flowering, or 9 weeks after germination of seeds, reaches a height of 70 - 80 cm and is able to achieve 600 grams per square meter. In the garden, the flowering time of Lemon Haze Auto is the same as indoors, while production is between 70 and 80 grams per plant. There she gets a little bigger.